This week on WELSTech, we finish off our month-long focus on professional development by talking to Jason Schmidt about his approach to conferences, advanced degrees and helping others “sharpen” their tech skills. Formal education – Just back from the Future of Education Technology Conference 2018 in an unknown destination, semi-regular education co-host Jason Schmidt shares his thoughts on certifications and advanced degrees as well as church and school financial support of staff professional development. He also shares his favorite “shiny” tech he observed at the conference – the Sharper Origin, a hand-held CNC machine (video). Interactive Faith online Bible Study – Isaiah: God confronts and comforts his people – Pastor Daniel Habben from St. John’s, Antigua leads the study on Wednesday’s now through February 7 at 6 pm and 8 pm (central). Daily video devotions from Peace in North Mankato, MN are reaching 2,000+ subscribers. tune in on Facebook (facebook.com/PeaceDevotions) or at peacedevotions.com. This week’s WELSTech double feature kicks off with a sample instructional video from our Ministry Resource discussion – MathCounts Mini #77 – More Counting Using Cases. And, new on the WELSTech Vimeo “Likes” List is WELS Year in Review. Episode 535 – The February WELSTech focus on training volunteers kicks off with a discussion of worship projection and an interview with Kristen Tetteh from Proclaim software. Release date: Thursday, February 8. If there is one skill you want sharp, it’s Bible Study. Today’s technology tools make that easier than ever with online bibles, bible studies, tools, and more. Today’s picks are “google-centric” and there’s a great interview with Pastor Brock Groth, the man behind understandchristianity.com. Rooted and built up – The topic of “Sharpening Your Skills” naturally leads the Christian to consider ways to grow their knowledge of God’s Word. Martin and Sallie discuss digital Bible features, resources from WELS and Northwestern Publishing House (NPH) for being in the Word, and ways to incorporate Bible study into meetings, journaling and social media. Understand Christianity – Pastor Brock Groth from St. Mark’s Lutheran Church in Citrus Heights, CA shares the story behind his website, UnderstandChristianity.com. What started as a book effort is now an informative site, featuring notes from Pastor Groth’s Seminary studies transformed into informative posts on Bible teachings and popular Timelines. Riverview Lutheran School in Appleton, WI recently hosted a VEX IQ robotics “scrimmage” for middle school students. St. Lucas Lutheran School participants shared their experience. Minnesota District President Charles Degner’s sermon on 1 Peter 1:10-12 is a great encouragement study God’s Word, our great heritage! Watch the archived live stream of the MN District Reformation 500 service from the The Chapel of the Christ at Martin Luther College. The sermon begins at the 1:02:00 mark in the video. Episode 533 – Helping others sharpen their skills can be a challenge. Tune in for a WELSTech discussion on the topic. Release date: Wednesday, January 24. A new year brings new opportunities and professional development resolutions. We all have a lot to learn, especially if we would like to keep up with current options in technology. This episode covers different ways to plan for, curate and consume learning resources that will keep you current. You may even be inspired to share your knowledge via a blog or, dare we say, a podcast! Learn something new – Martin and Sallie kick off the January discussion topic, Sharpen Your Skills, with a look at sources and methods for professional and personal development. Interactive Faith online Bible Study – Isaiah: God confronts and comforts his people – Missionary Daniel Habben from St. John, Antigua leads the study on Wednesday’s beginning January 10 through February 7 at 6 pm and 8 pm CST. Mark your calendars for the WELS Ed, Tech, Lead Summit, happening June 25-27 at the Kalahari Resort in Wisconsin Dells, WI. Learn more and sign up for updates at welsedtechlead.com. New on the WELSTech YouTube Instructional Playlist, Starting a PLN on Twitter: A Quick Guide For Teachers from Common Sense Education. Consider subscribing to their YouTube channel. Episode 532 – The “Sharpen Your Skills” focus continues next week. There’s still more to learn! Release date: Wednesday, January 17. 2018 begins with another celebration – 10 years of WELSTech! 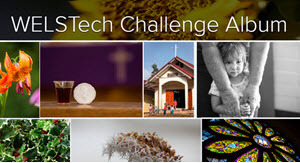 We look back at episode one and ahead to a new year of exciting new tech and ministry ideas. Sallie has a “magic” cube that you have to see to believe, and Martin has his sights set on better mobile applications for our WELS audience. New in 2018 – Martin and Sallie celebrate 10 years of WELSTech podcasting and talk about the year ahead. From bullet journals to grand kids to full-time RVing, the year promises to be an exciting one on the personal level. And of course, there’s lots of exciting new technology to look forward to this year as well. Sallie shares her experience with the Merge Cube, while Martin explains PWAs (installable web sites). And the biggest news is a brand new tech skills clearing house called WELSTech Skills (skills.welstech.net). Add a listing to showcase your tech skill set and search the listings to find skilled workers. Learn about the latest mission developments in Latin America in the December 2017 Update, a new addition on the WELSTech Vimeo Like’s list. Episode 531 – Tune in for the start of our January WELSTech focus – Sharpen Your Skills. Release date: Wednesday, January 10.